The mass slaughter in Paris, the lock down in Brussels, the anti-Arab paranoia on the European far right, the backlash against Syrian refugees, open borders, the very idea of European integration, the xenophobic fulmination of Donald Trump and Ben Carson, the French airstrikes on Raqqa, Vladimir Putin’s diplomatic coups in the UN Security Council, the battlefields of the Middle East and Iran’s Supreme Leader’s salon: ISIS killers have reshaped the political diplomatic and military realities of the world. ISIS is a threat to world peace, to the idea of human decency and multi-cultural coexistence in the global village. The Paris atrocities followed suicide bomb outrages in Beirut, Ankara, Baghdad, Kuwait as well as the bomb threat blew up a Russian passenger jet right over the Sinai Peninsula. ISIS, with its apocalyptic vision of a war among civilizations, has done its best to provoke religious and sectarian hatred in the Middle East in a cruel, pitiless throwback to the Middle East Ages. A self-styled caliphate that murders, rapes, beheads, shoots, crucifies and enslaves its “infidel” and “apostate” enemies, ISIS is a death cult run amok in the heart of the Arab World. France is now at war with ISIS in the Syria It once ruled under the League of Nations mandate a century ago. Host to 7 million Arab Muslims, legacies of 130 year old colonial rule in Algeria, France is now mired in the violent politics of the post Ottoman Levant it once helped create. 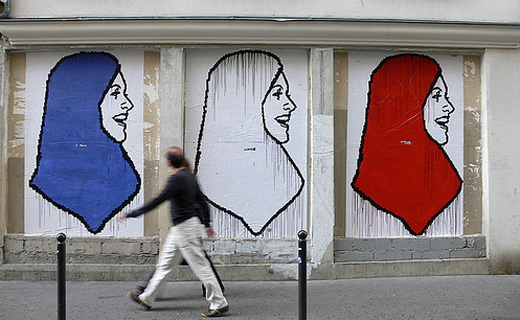 France offends ISIS with its liberal, secular Republic, with its veneration of art, beauty, wine and love, its joie de vivre. This hatred was the reason ISIS sent French and Belgian citizens of Maghrebi decent to massacre Parisians in bars, restaurant terraces, pizzerias and heavy metal concerts. Now the Le Petit Cambodge and Bataclan Theatre have joined the Twin Towers, the Mumbai Taj Hotel, the London Tube and the Madrid rail network in the chronology of terror. While Parisians defy the terrorists with slogans such as “pas peur”, millions of Muslims across Europe will feel visceral fear as the anti-immigration national backlash escalates. ISIS, in its perverted way, has resurrected the ghosts of the Frankish knights who forged Crusader Kingdoms in the Syrian-Lebanese coast eight hundred years ago. France almost fell victim to civil war, a paratrooper putsch and multiple assassination plots against President de Gaulle during the Algerian War. France’s economic woes will only be magnified by its new wars in the Middle East and its protracted state of emergency. Intelligence officer’s estimate thousands of French, Belgian, British and German and other European citizens have joined ISIS (1) . These young jihadists with Western passports will be a security nightmare to a Europe horrified at the violent ideologies of hate they promote (2). Not since the Nazi expansion in the 1940’s has Western Europe feared massacres in their own ancient cities. The slaughter and murder that once destroyed Beirut, Baghdad, Aleppo and Mogadishu has now come to the streets of Paris. ISIS has also successfully infiltrated suicide bombers amid the flood of Syrian refugees entering the EU via Greece. ISIS wants to punish Syrian refugees who dared to flee Abu Bakr Al Baghdadi’s barbaric “Caliphate”. ISIS also wants to recruit thousands of alienated young Muslims to join its ranks and therefore does its best to provoke a police crackdown on immigrants in France and Belgium . Compassion, humanity, a dialogue among cultures, religious tolerance, the world of ideas and beauty and human possibility are alien to the fundamentalist zealots of the Caliphate. Western politicians fell into ISIS’s trap. Marine Le Pen called for a halt in the influx of Syrian refugees. Trump talks about special ID’s for American Muslims, akin to the interned Japanese Americans after Pearl Harbor or the Jews with the Stars of David’s on their chests in the Third Reich. President Hollande is now a war time leader, two generations after the Suez Crisis, the Algerian War and Gaullist interventions in Francophone West Africa. From Libya to Mali, Iraq to Syria, France is once again a military combatant in Africa and the Arab World. Despite the slaughter in Paris, the Obama White House (and the American people) have no appetite to send ground troops to vanquish ISIS. The U.S, like Britain, in the early 1970’s, faces its own imperial retreat, East of Suez moment. ISIS has reshaped world politics to a scale unimaginable to the terrorists of Al-Qaeda in Iraq, its progenitor. Its affiliates have created terror and mayhem from Mali to the Sinai, Libya to Kuwait. It runs a virtual quasi-state with more territory than Jordan. It has literally bulldozed the Sykes-Picot drawn border Syria and Iraq. It has threatened the political legitimacy of Saudi Arabia as the leader of the Arab/Islamic world. It has reshaped the refugee debate in Europe and the U.S. It has revived the sectarian tensions in Islam. It has championed Sunni rage against the Alawite government in Damascus and the “Shia” led government in Baghdad. It has revived atavistic fears of Islam in France’s far right and amplified the social threat of the largely Maghrebi population on the outskirts of Paris. It has turned Putin’s Russia into the target of Syrian Sunni rage. It has increased the odds of Dr. Assad’s regime survival. It has catalyzed French-Russian rapprochement. It has symbolized the death rattle of the post Ottoman Arab settlements and midwifed a new, pitiless, sectarian system (3). It has exposed U.S impotence and policy incoherence in the Syrian civil war. It has justified Iranian intervention in Syria and exposed the policy failures of Turkey and Qatar with the anti-Assad rebels. It has destabilized Egypt, Lebanon, Jordan, Turkey and Iraqi Kurdistan. It has revived Ankara-Kurdish tensions . ISIS, with its online footprint, redefines the monstrous globalization of jihadi terror. The Raqqa Caliphate has reshaped world politics.